Borderlands 2 sports a gazillion amount of guns that are generated by the game’s weapon engine. These come with different stats and levels of rarity as well. This allows you to get very unique gear that others may not have. So what can you do to help increase the likelyhood of getting some awesome weapons? Perhaps some great elemental weapons. Check out below. There are also SERAPH items that require the use of Seraph Crystals. Finding loot and good gear doesn’t have to be that hard. You can get rare shields, legendary weapons, epic class mods, and rare grenade mods + artifacts / relics. Look below to see the best way of getting these items. Something important to keep in mind is that you should do all item hunting and farming during Playthrough 2 instead of through the original Playthrough — Playthrough 1 — as enemies get harder the second time around and drop better loot. Here’s a short and simple guide on how to disable WordPress COMMENTS on INDIVIDUAL posts and pages. It’s straight forward and easy to do, but the option is somewhat more hidden than it should be. It’s actually just a checkbox though that you uncheck for the page. Follow our guide, which includes screenshots, to help you disable comments on single pages and single posts for WordPress! No plugins required. All done! 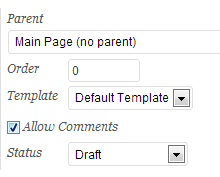 You have now disabled comments for that single page or post.